Audirvana Plus music player offers ‘improved’ sound, hi-res and MQA support | What Hi-Fi? Already available for Mac, the software is coming to Windows in June and costs £67. 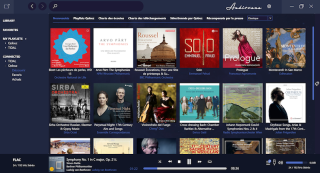 Since 2011, French company Audirvana has promised Mac users a better-sounding music player alternative to iTunes. It’s marketed itself as a ‘HiFi player’, a platform similar to Roon, where all of your music – from local and networked files to Tidal and Qobuz streaming services – can be integrated and, Audirvana claims, played in better audio quality. To make good on the latter, the software supposedly shortens the audio signal path to reduce noise, and performs digital processing before its conversion to analogue. Soon, however, the player will no longer be exclusive to Appleites. Audirvana has announced that from next month its Audirvana Plus player will also be available on PCs running Windows 10. Like the Mac version, the Windows variant (available in both a desktop and mobile app versions) will be able to support playback of FLAC, WAV and AIFF hi-res files, as well those packaged in MQA and DSD. It also introduces some of Audirvana’s latest interface and usability developments, including viewing by artists (in addition to tracks and albums), a direct selection of the device on the main interface, a redesigned search engine and a new mini-player. Available in June, the Audirvana Plus for Windows 10 costs £67 (following a 15-day free trial), and includes a three-month subscription to Tidal and a one-month subscription to Qobuz. Where can you buy hi-res music?